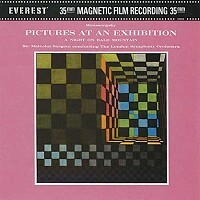 Another of the series of Everest recordings done in London with Sir Malcolm Sargent conducting the London Symphony, in this event performing a couple of old war horses in Pictures and Night on Bald Mountain. To say these were definitive performances would be overstating the case, however, they are perfectly executed if at a bit slower pace than others – notably the Reiner/CSO on RCA. Rene Leibowitz's performances on Power of the Orchestra (RCA VCS 2659) have been the sonic standards for many years, but the Everest takes the sonics that make these pieces sing to a new level of reality – you can for a moment actually believe you are in the Hall. It takes a certain majesty to pull off full orchestra reality in the home environment and this recording comes as close as possible to fully achieving that effortless sense of size necessary to do so. Bert Whyte is again at the controls for another outstanding Everest 35mm recording at London's famed Walthamstow Assembly Hall – the same hall used extensively by Decca and Kenneth Wilkinson.